The 1997 McLaren F1 GTR ‘Longtail’ was the ultimate evolution of the Le Mans-winning F1 GTR. Two decades on, the limited-edition 675LT follows its uncompromising ethos to create a visceral driving experience of unique intensity. More power, less weight, more precision – nothing has escaped our attention in the quest for perfection on both road and track. In a McLaren, nothing is superfluous. The stunning design of the 675LT satisfies the most demanding of engineering requirements, minimising drag, optimising downforce and enhancing cooling wherever possible. The fact that it looks extraordinarily exciting at a standstill is a rewarding by-product of this approach. The focused interior intensifies the thrill of driving the 675LT. Long associated with an uncompromising motorsport ethos, lightweight Alcantara is offered as standard equipment throughout the interior. Elongated steering wheel-mounted gear-shift paddles finished in satin-lacquered carbon fibre, meanwhile, ensure gear changes are easily accessible in the heat of on-track battles. Featuring carbon fibre construction and trimmed predominantly in Alcantara with leather detailing, the racing seats contribute 15kg to the overall 100kg weight saving. 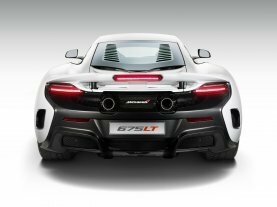 The raw and intoxicating soundtrack of the 675LT is provided by a unique titanium exhaust which features a crossover muffler to maximise performance. 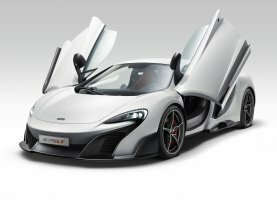 Our seven-speed dual-clutch gearbox already provides near-instantaneous shifts to the other models in the McLaren Super Series, but the 675LT’s revised software strategy slashes response times to make gearchanges in half the time. Briefly cutting the ignition between changes creates the fastest possible shift, and an incredibly intense sound. The result is not only increased performance but a heightened sense of connection for the driver. The active ‘Longtail’ Airbrake is 50 percent larger than that on the other models in the Super Series but is also lighter due to its carbon fibre construction. It is subtly integrated with the all-new carbon fibre rear deck when not deployed, automatically increases aerodynamic stability at speed, and deploys more aggressively under hard braking to support the carbon ceramic brake discs and reducing forward pitch. Road-legal, but with an extreme track focus, Pirelli P-ZERO™ Trofeo R tyres are fitted to the 675LT as standard equipment for peerless handling. The highly specialised tread pattern creates six percent more grip in normal conditions, and a stiffer structure significantly increases steering response and supports the sharper handling of the 675LT. Road-biased Pirelli P-ZERO™ tyres are available as a no-cost option.